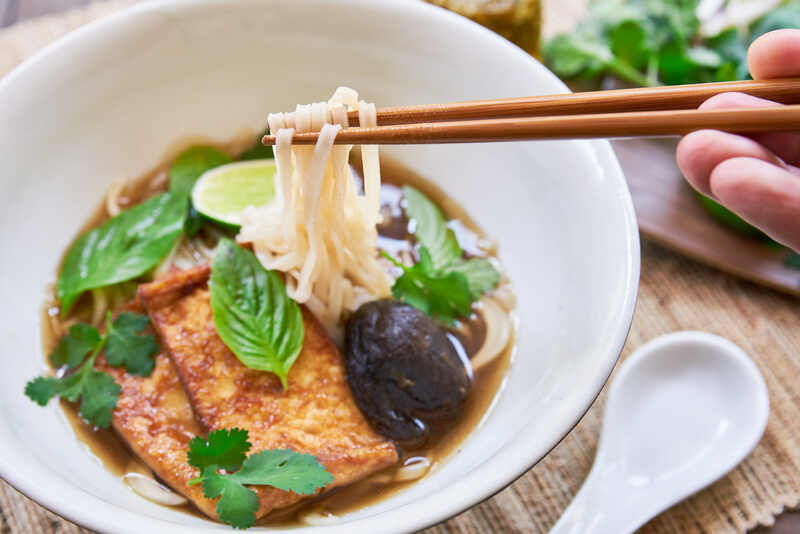 This mushroom-based vegan pho may be plant-based, but it has all the lip-smacking umami of the original, neatly balanced by the sweet smokiness of the char-grilled aromatics, while warm spices like cinnamon, star anise, and cloves hit all the right notes. I often tell people that I’ll become vegan on the day that there are equal or better tasting plant-based substitutes for all my favorite foods. With this mushroom pho, I can cross another one of those foods off my list. I’d be lying to you if I told you it tastes exactly the same as a bowl of beef pho, but it hits all the right notes, and it’s brimming with meaty umami you wouldn’t normally expect from a plant-based soup. The result is a bowl of mushroom pho that’s just as (if not more) satisfying than the original. When you factor in the time it takes to make a proper bowl of Pho Bo, I just can’t see myself going back unless someone else is making it. The trick to getting a beefy flavor in the broth is to use a combination of dried mushrooms for the base of the broth. I used a combination of dried shiitakes and dried maitakes because they both have a flavor that reminds me of a well-browned piece of roast beef. In today’s world where fresh ingredients are available everywhere, you might be tempted to use fresh mushrooms, but don’t do it! 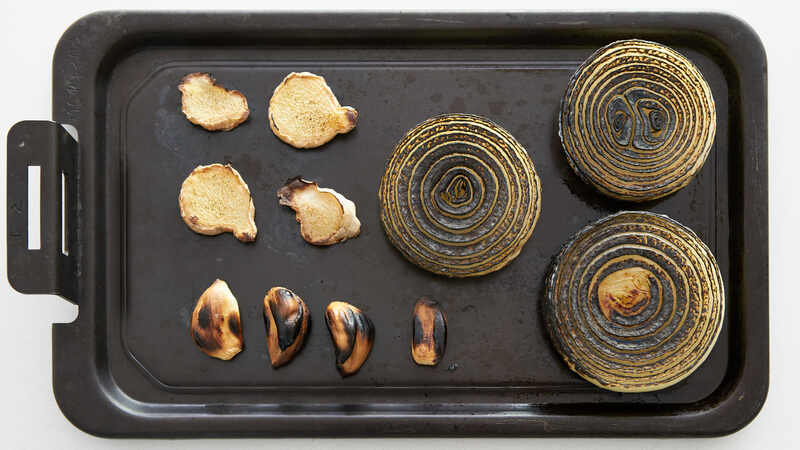 Drying mushrooms not only concentrates their flavors but it also significantly increases their content of umami producing amino acids such as glutamate and guanosine monophosphate. In the case of shiitake mushrooms, dried shiitakes contain over 15 times the amount of glutamate as their fresh counterparts! 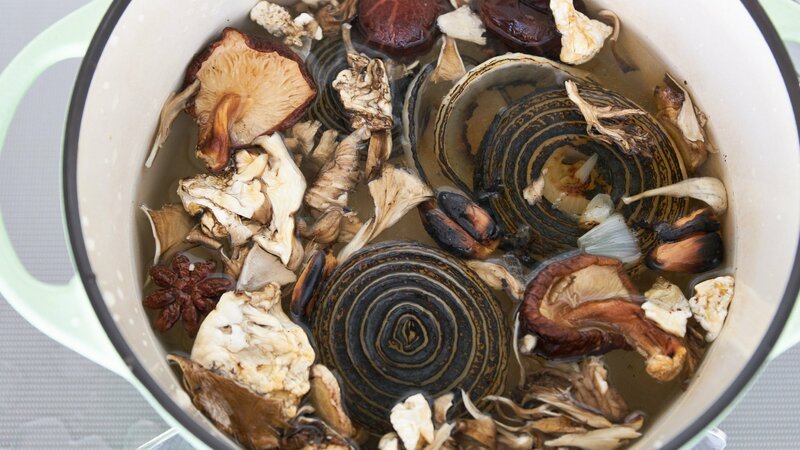 If you used fresh mushrooms, you’d have to use a lot more, and the resulting soup still wouldn’t taste as good as one made with dried mushrooms. The other benefit of using dried mushrooms is that they give their flavor up much faster than fresh ones, so this broth only takes about 30 minutes to make. You could probably get this done even quicker if you presoak the mushrooms and spices overnight, but part of the magic of Pho is the heady aroma the broth releases as it simmers away. That’s why I like to let it go a bit longer, allowing all the flavors in the pot to get to know each other. I’ve seen a lot of “quick pho” recipes that throw the aromatics into the pot raw, but if you’ve ever made a bowl of really good homemade pho you’ll know how crucial this step is to create an authentic pho. 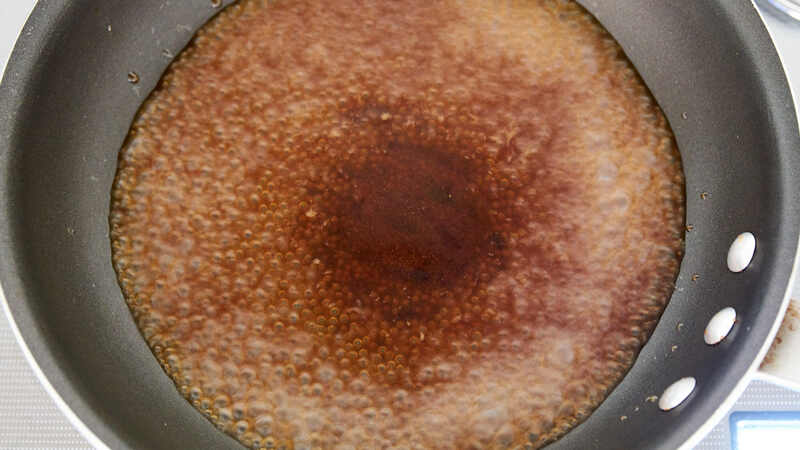 It’s not just about the hints of smoke and caramel the charring adds to the soup. The Maillard reaction comes into play here, and the grilling creates dozens of new flavor compounds that add depth and complexity to the finished soup. This is doubly important in a plant-based pho, where we need to eke out as much flavor as we can from each ingredient. Originally I toyed with the idea of adding soy sauce as a substitute for the fish sauce, but there’s a couple of reasons why I decided against it. The first is that between the mushrooms and the charred aromatics the broth already has a beautiful mahogany color. Adding soy sauce would turn the broth an inky shade of brown which is a bit too dark for this dish. The second reason is that soy sauce will make this soup taste like soy sauce. That’s fine if you’re trying to make a bowl of udon, but that’s not what pho is about. I ended up using plain table salt. 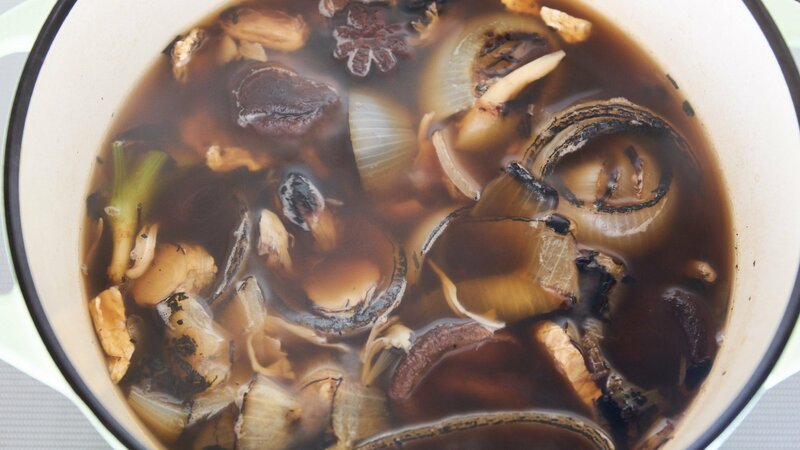 It may not have the amino acid content of soy sauce, but you get plenty of those from the mushrooms and aromatics while preserving the flavor the broth. One other option is to use white soy sauce. This is a minimally aged soy sauce that has a light amber color and neutral flavor. It can be a bit hard to find unless you have a Japanese grocery store nearby, which is why I made this recipe using salt. Finally, to balance out the sharpness of the salt and to draw out the caramel notes in the charred aromatics, I like to add a bit of coconut sugar. This is entirely optional, but I find that it develops a more balanced full-bodied broth. Put the rice noodles in a tray and cover with cold water. Let the noodles rehydrate for 1-hour stirring occasionally to keep them from sticking together. Drain and keep covered until you are ready to use them. You can do this ahead of time and store the noodles in a resealable bag. Peel and slice the onion into 1/2-inch thick slices (like you're making onion rings). Slice the ginger into 1/4-inch thick coins. Peel the ginger. Place the aromatics on a baking sheet. Move the oven rack to the top position and broil on high until the tops of the aromatics are charred (you may need to remove the garlic first). 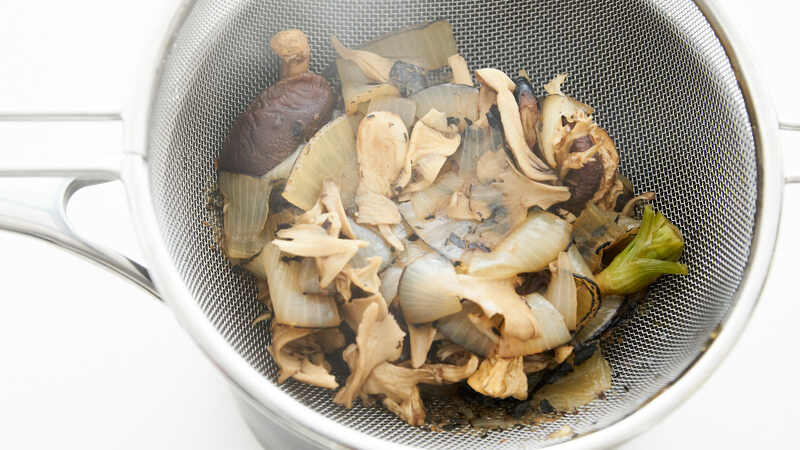 Add the charred aromatics to a pot, along with the water, cloves, cinnamon, star anise, dried maitake, dried shiitake, cilantro root, salt, and sugar. Bring the mixture to a boil and turn the heat down to maintain a gentle simmer. Cook the broth for 30 minutes. Strain the broth, pressing on the solids to get as much soup out as you can. Pick out the shiitake and maitake mushrooms and discard the rest of the solids. Keep the broth warm on the stove. 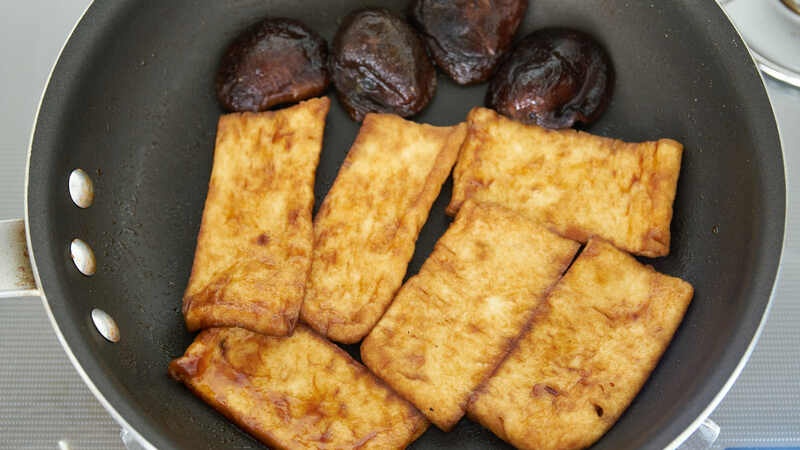 To make the topping, cut the fried tofu, shiitake, and maitake into bite-size pieces. Add 1/4 cup of the pho broth to a small saute pan along with the hoisin sauce. 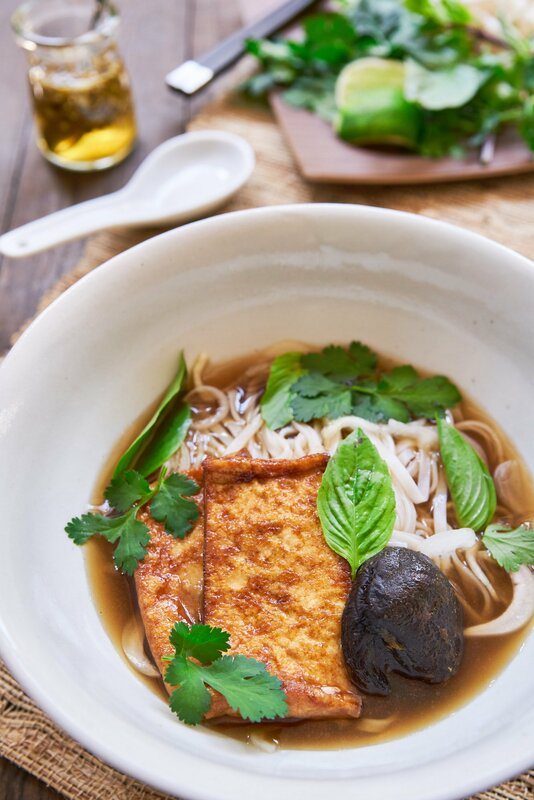 Bring to a boil and add the fried tofu, shiitake and maitake mushrooms. Cook until there is no liquid left and the tofu and mushrooms are glazed with the sauce. Boil the noodles until tender (1-2 minutes) and then drain. Split the noodles between two bowls and then top with the sliced sweet onions. 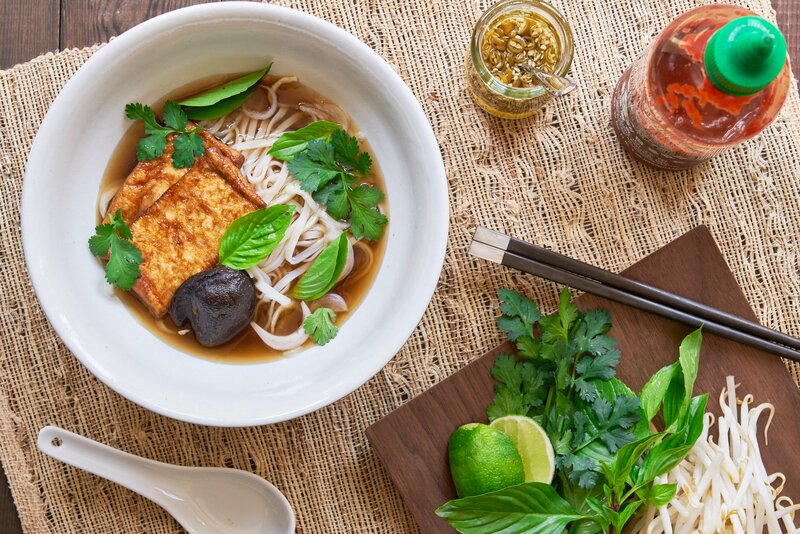 Serve with the bean sprouts, basil, cilantro, sriracha, and hoisin sauce.